Florida Atlantic came into Sunday afternoon knowing that they would need some luck to play another day, but they just couldn’t find enough of it. Facing Oregon State in the first game of the afternoon, designated hitter Eddie Cassidy hit three homeruns to help FAU stay alive. The lucky part for the Owls was Cassidy almost didn’t play in the game at all. Head coach John McCormack was going to use the designated hitter spot for outfielder Andy Mee. “We were thinking about having Mee just hit today, but he said he was ready to go, and sometimes the best decisions you make are the ones you don’t make,” said McCormack. Cassidy’s hot bat, along with seven innings of pitching from the Owls bullpen, was good enough for an 11-7 win, and the opportunity to play Regional host Florida in the finals. Florida Atlantic would need to win two games in a row to advance. 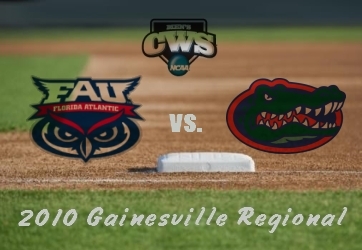 But once FAU got to the Gators, their luck had all but run out as the Owls suffered their worst loss of the year falling 15-0. Due to rain delays that backed up the first game of the day, FAU only had an hour between the end of the Oregon State game and the start of the Florida game. Having already used the team’s top three pitchers earlier in the weekend, McCormack decided to start pitcher Taylor Everist. Everist was no match for the Gators lineup, as he gave up six runs in the first three innings. Half of those runs came on back-to-back-to-back homeruns - a first for UF this season. “They jumped on us early, and we couldn’t respond at all,” said second baseman Ryan Church. Freshman pitcher Kevin Alexander was then called upon to get some outs and face the number three team in the nation’s lineup. Alexander worked his way through five innings, giving up only one earned run and looked strong at times. Cassidy continued his hitting, grabbing the Owls only extra base hit against the Gators, a double to the wall. The nine hits Cassidy had were three away from Florida Atlantic’s regional tournament record, but his homeruns and seven RBIs against Oregon State broke the individual game record. Alexander couldn’t hold of the Gators off all night, as he gave up six runs in the eighth inning and then was replaced before a two run ninth. Florida’s version of Cassidy, Tyler Thompson, hit three homeruns against the Owls pitching, which was good enough to make the Gainesville Regional All-Tournament team. Cassidy, Ryan Church and Sean Bukovich also made the team. Florida’s starting pitcher, Brain Johnson, was named the regional Most Valuable Player, after his seven inning, no run outing. “He’s going to be special, and he got after us tonight,” said McCormack. The offense never showed up for Florida Atlantic, producing zero runs on only eight hits. The Owls were shutout for just the third time this season, and the Gators got their biggest margin of victory on the year. “Florida was really good tonight, we just could not get on track, there pitching, hitting and game plan were just too good,” McCormack said of the game. Florida Atlantic ends their season with a 37-24 record, and the most wins the school has had since 2005. “We won our conference, which isn’t an easy thing to do. For ten straight weeks we won every series, but we couldn’t get on track tonight,” McCormack explained. Cassidy was the lone bright spot for the Owls' offense against Florida, going 2-for-3.